Moving to Alaska – Day 5. We are getting good at packing up our camp. From waking up to driving away takes us about 2 hours. We are never in a rush. Breakfast takes a while. Dishes have to be done in some water. We bought Dr. Bronner’s soap for doing dishes, washing clothes, and bathing. We feel that this is the least harmful thing for the environment that we can use. We have to deflate our airbed, pack up the two human and one dog sleeping bag, fold the sheets and blankets, and use Tetris like maneuvers to repack the car. Luckily, there weather has been nice every day. Here is a short video of what you get when you pay nothing. Fire pit, composting toilet, picnic table, and a spot for a place to sleep. From our recreation site (Forest Lake Recreation Site) we headed towards Quesnel. Quensnel has a certain smell. With 2 pulp mills, a plywood plant, and 5 sawmills, you could say that timber is important in the region. Quesnel is also home to the longest wood truss walking bridge in the world. Here we are on it. Longest wood truss walking bridge in the world. We are staying at the 10 Mile Provincial Park tonight. The provincial parks are really nice. Almost too nice. Hot showers, over 100 sites, firewood for sale, and lots of RVs. It is nice once in awhile, but not really our thing. When we arrived, thunderstorms were in the forecast. We set up the tent just as the rain started. We are able to fit our air bed and a small table inside so we can play cards, eat dinner, and listen to music, all while staying dry. We even brought the dogs beds on this trip so everyone can sleep comfortably. There are a lot of lakes in this part of the world. It makes for beautiful sunset pictures. 10 mile lake, late at night. 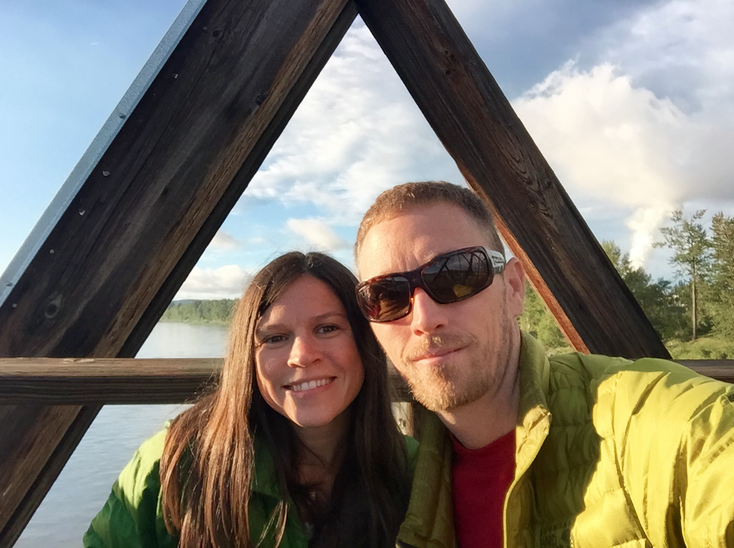 This entry was posted in canada, moving and tagged adventure, bridge, British Columbia, Canada, fly fishing, travel by Rory. Bookmark the permalink.